Chances are, if you are reading this you are aware of breast cancer. You may not know all the details, but you know it can be an incredibly scary diagnosis. By now, you are aware that women should regularly do breast self-exams. You know regular mammograms are important, beginning at age 40 or based on family history (please communicate with your doctor when it is right for you to begin these). You might also be aware that men can get breast cancer. We are a society full of awareness. Thank goodness for that. In fact, when you see that color pink on products and people, especially in October, what is the first thing that comes to mind? 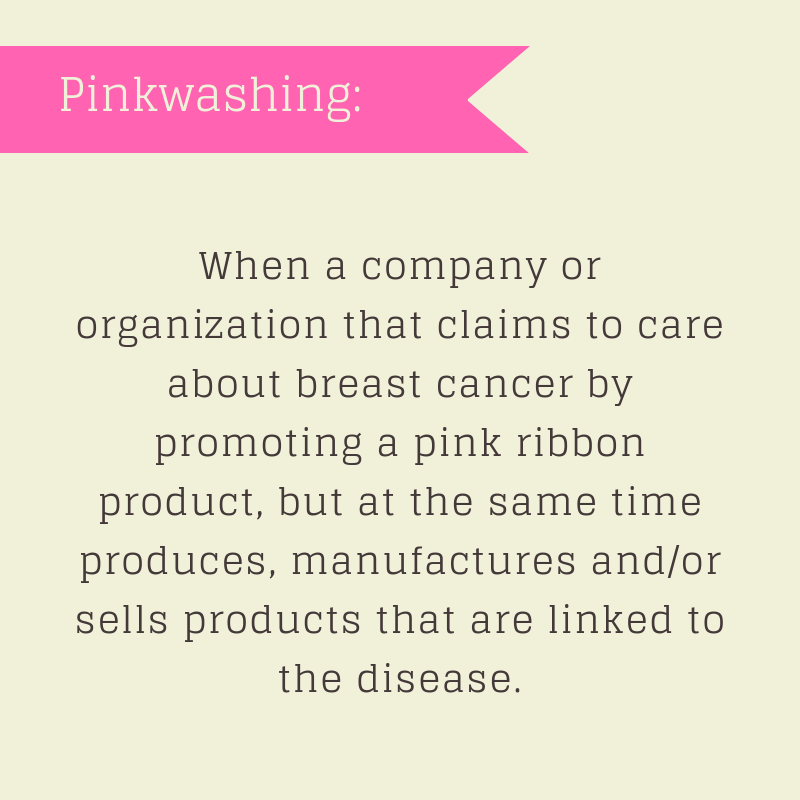 If you are buying something because you need it and it also happens to have a pink ribbon (plus it doesn’t contain carcinogenic ingredients or hazards; more on that in a minute), then go for it. If you’re buying something simply because it has the pink ribbon? Rethink that pink! 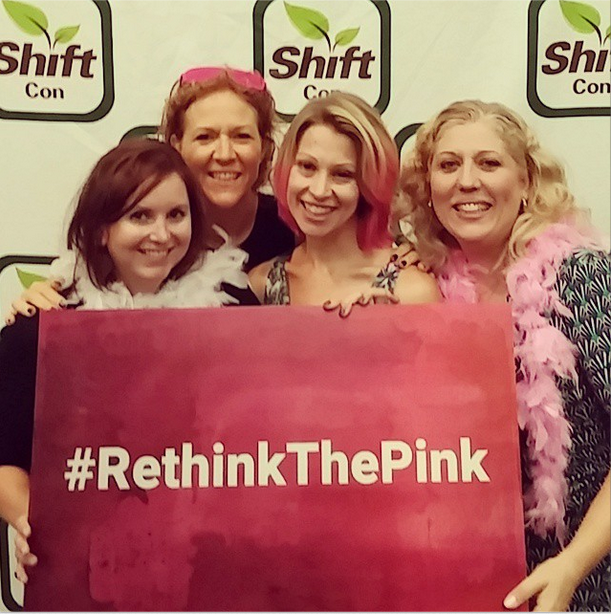 We pledged at ShiftCon to rethink the pink. Did you know that the largest corporations with their huge pink marketing campaigns spend more money on their pink products, many of which directly and indirectly lead to this very cancer, than on breast cancer research? Even Susan G. Komen has simply become a marketing monolith of pinkwashing. Komen spends more time and money protecting its “for the Cure” phrase, politics, and marketing their pink ribbon for awareness on products than actually raising money for a cure. There is little in the pink that leads to prevention or cure for breast cancer. What you will find instead are, in partnership with the Susan G. Komen Foundation, fracking drill bits which will help inject possible and known carcinogens into the ground. These then leak into the surrounding environment and water supply. That was this year’s palm-to-forehead product. I am sure you’ve seen more, from plastic water bottles to endocrine disruptors in fragrances and cosmetics, the list goes on and on what people will slap a pink ribbon on to show their “support.” Often this support costs them little, goes to organizations with little aspirations of prevention and cure, yet reaps huge profits. Ugh. Can I shake off my disgust for a minute? It is time to move our focus from awareness and move toward new research on breast cancer cause, prevention, and cure. Luckily there are some great organizations helping us do just that and they need our help to get their names in front of the people. Have you heard of pinkwashing before? What do you do to make sure you are not supporting it? I especially welcome comments from breast cancer survivors on how they feel about the pinking of October… Please join the conversation! Brenna, I’m watching my mom go through breast cancer for the fourth time and feel strongly about pinkwashing. When she first was diagnosed, about 9 years ago, I bought all the pink things because I simply didn’t know enough about the toxins in these products. I felt that I was doing my part to help her in some way beyond my control. Now, I know better. I’m thankful that there is a shift happening towards prevention, causes, as well as us demanding transparency from companies. Passing this along. Great post Brenna! I absolutely love that photo. Hope the Twitter party went well tonight. Sorry I couldn’t make it. Thank you for placing the focus on prevention rather than awareness. There are so many great organizations working on prevention. I’m honored to have worked with and for many of them! I feel like we’re gaining momentum and actually building a movement around the need to prevent exposure to toxic chemicals where possible! Breast cancer is one of the most common cancers in the world today. In a survey, there are eight out of ten women and four out of ten men are suffering from breast cancer through their life span.We should be alert about the symptoms breast cancer.